Sunway Malls is seeing a surge in traffic and sales on the back of the launch of its Pokemon Go Lure Module earlier on 9 August– just a few days after the popular game was officially introduced in the country. The retail group said in a statement to A+M, with the retail industry already beset with a 4.4% fall in Q1 2016, the surge has offered a temporary relief for retailers. In comparison, growth was up 4.6% a year ago according to Retail Group Malaysia’s figures. Riding on game’s ability in moving large traction of traffic across various Poke stops, Sunway Malls was among the early adopters of the lure module activation to drive traffic into group’s four malls – Sunway Pyramid, Sunway Putra, Sunway Giza and Sunway Carnival in Klang Valley and Penang. “To date, we have seen traffic increase by an average of 10% for Sunway Pyramid, 8% for Sunway Giza, 6% for Sunway Putra Mall, and 4% for Sunway Carnival Mall,” Kevin Tan, chief operating officer of Sunway Malls said. Sunway said its preliminary report also suggests a rise in sales especially for its F&B retailers. “We are unable to verify exactly the total amount of overall sales achieved at the moment, but some of our retailers have shared that their shops have been busy because of the campaign. Currently, it looks like F&B operators have the most to gain whilst fashion retailers see the traffic but business is as usual,” Tan added. For example, for its Sunway Pyramid – F&B operator Gong Cha at recorded a 10% increase in sales while snacks retailers J&G Chicken and Crispy Crust saw higher than average sales. Similar trends were also observed in both Sunway Putra Mall and Sunway Giza, averaging an 8% increase. Over in Penang, Sunway Carnival reported the best results by far, with retailers such as Bread History recording a sales increase of 50% since the campaign began. Meanwhile, F&B operators Mocktail Bar and Blackball saw a 30% increase while Winter Warmers reported a 20% increase in sales. Other F&B operators of the mall such as Chatime, Sushi King, Kim Gary, New Zealand Natural and Shihlin Taiwan Street Snacks recorded a 15% increase in sales while Sakae Sushi, Yoshinoya, Starbucks and Kaffa Signature saw sales increased by 10%. A check on Google Trends also showed that the search for Sunway Pyramid coordinate shot up by a whopping 5000% due to its popularity as one of the locations with the most Poke stops, whereas Sunway Putra Mall saw a 180% increase for searches related to the mall’s tenant offerings. Much of this could be attributed to the fact that Malaysia was made to wait for Pokemon Go launch until recently, said the company. The game has been trending worldwide pending its official release here. “We saw it as our opportunity to leverage on game’s immense potential. The one thing unique about Pokemon Go is that gamers are finally coming out of their houses and converging in the outdoors. They have to explore their surroundings and learn the locations of the stops and gyms and familiarise themselves with whichever areas they are in, which is great for us as it means they explore our mall. All these will ultimately translate into business and sales for our retailers,” Kevin said. It is widely known that malls in general have high traffic during the festive period and school holidays, but Sunway said – the introduction of Pokemon Go has certainly spiked up the footfall for the non-peak season. Ever since the introduction of GST (Goods & Service Tax) April last year, Malaysians were subsequently hit by the removal of petrol subsidy, sugar, inflation and drop in currency value. The retail and mall industry has been hit with lower consumer confidence, lower consumer spend and certainly lower footfall for certain malls. 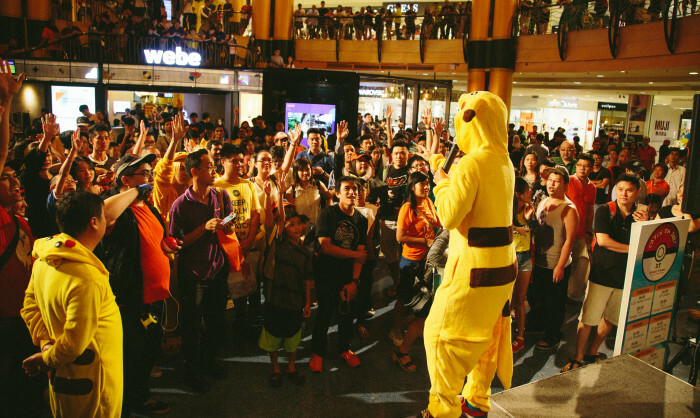 This prompted various malls in Malaysia to step up efforts in attracting more footfall, and riding the well-received Pokemon Go games is just one of the many strategies in place. LOOK Should you be playing Pokemon Go during the Seventh month? Its called INTEGRITY. More here. ..